A detailed travel guide for business traveler to Minneapolis. Local advices about restaurants, shopping spots, accommodation and attractions can be found. For anyone that currently has a business or academic trip planned in Minneapolis, Minnesota, there are a wide range of different sights to see, food to eat and activities to participate in. When visiting the city, it's important to know that Minneapolis is one of the two locations that make up the Twin Cities. The other part is Saint Paul. With more than 390,000 residents, the city of Minneapolis is the biggest city in the state of Minnesota. Broken down into six different districts including downtown, north, northeast, south, southwest and southeast, there is a wide range of different things to do in the city. One of the most popular districts is the downtown area. This section of Minneapolis is the city's main business district that is also the home to popular theater facilities, beautiful parks and historic ruins that lay along the Mississippi River. If you are visiting the area for a business trip, this is probably the place where you will be spending most of your time. The downtown area has a wide range of diverse cultural offerings that will all be able to entertain you for days. Some of the best places to tour when visiting the beautiful city of Minneapolis include the Institute of Arts, Lake Harriet, the Riverview Theater and the Museum of Russian Art. Luckily for visitors, navigating through Minneapolis is relatively easy. All of the streets are designed around a specific grid system that is not difficult to learn and is separated into different quadrants; Northeast, North, Southeast and South. The main street divider is Hennepin Avenue that segregates the downtown streets marked with either an S or N. The best part is, even the smaller streets are divided and marked in order to provide an easier traveling experience. For anyone that doesn't wish to travel by foot or needs to travel longer distances, there are a few different public transportation options available to visitors. The first option is the city's light rail. Although Minneapolis currently only has one light rail option, the blue line, there are still many downtown stops that are serviced. As the easiest and quickest choice, the blue line will bring you to the airport, Target Field, Mall of America, Hubert H. Humphrey Metrodome and all of the surrounding areas. Additionally, Minneapolis plans on opening its new green line in the spring of 2014. The new line will conveniently connect downtown Minneapolis with downtown Saint Paul. If you plan on visiting a more isolated area, a bus will be able to bring you to your destination. When traveling on the Minneapolis bus, it's important to know the difference between the different route options. For example, knowing the difference between Route 55 and Route 5 will be the main factor in arriving to the right location. Without question, the Minneapolis Institute of Arts is one of the most popular attractions that the city has to offer. Containing more the 4,000 years of global history, institute visitors can easily get lost in this gigantic museum that holds an estimated 80,000 different pictures, sculptures, drawings and paintings. In fact, if you’re touring the city on an academic visit, the Institute of Arts might already be on your itinerary. Another great place to visit in Minneapolis is the Riverview Theater. First built in the 1940's, this city attraction is regarded as Minneapolis's best theater and a true city gem. Since it was first built, there have been many updates and renovations conducted in order to preserve and maintain the amazing theater. For anyone that enjoys an entertaining theatrical performance, this is definitely the place to go. If you find yourself in Minneapolis on a business or academic trip with a little extra time on your hands, Lake Harriet will provide you with a relaxing experience and gorgeous views of the water. Here you can either enjoy the beautiful rose gardens or take a ride on the old electrical cars. While visiting Minneapolis, there are many unique places to eat. One of the most authentic eating destinations in the entire city is the Nicollete Avenue Eat Street. Here you will be presented with a variety of different ethnic dishes that will leave your taste buds wanting more. Some of the different food options include the Seafood Palace, Quang and Jasmine Deli, Little Tijuana and the Black Forest Inn. Another great dining experience that Minneapolis has to offer is the Midtown Global Market. Located on the first floor of an old Sears store, the midtown market now boasts a wide range of different restaurants and cafes that offer foods from all over the world. Here you can enjoy the Holy Land Deli and Bakery, Andy's Garage and a variety of both Mexican and Italian eateries. Regardless of what kind of food that you're in the mood for, Minneapolis has something to offer all of its visitors. For anyone that is traveling to the city of Minneapolis and wishes to do a little shopping, the Mall of America is a great place to visit. Hosting more than 40 million visitors a year, the Mall of America is one of the largest shopping locations in the entire world. Incredibly, the Minnesota based mall covers 4,870,000 square feet, which is enough to fit seven Yankee Stadiums. One of the most popular excursions that takes place in Minneapolis is the Segway Magical History Tour. 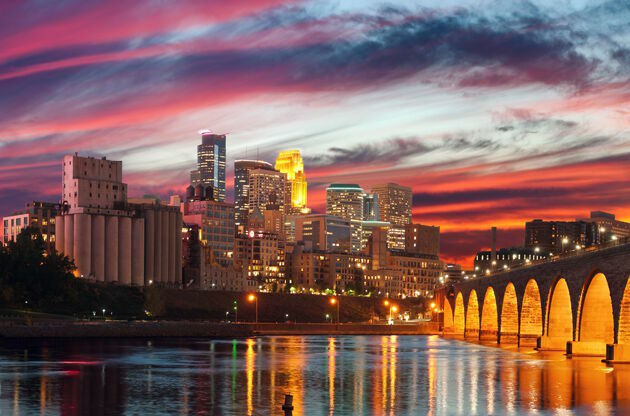 This interesting tour will bring you around the historic Minneapolis Riverfront and include stops at the Stone Arch Bridge, Mill Ruins Park, Guthrie Theater, Mill City Museum, West River Parkway, Gold Metal Park and the Father Hennepin Park. Hosting a wide range of different business events, the Minneapolis offers a variety of different options for business travelers and academicians. One of the most important venues in the city, Minnepolis Convention Center, which is equipped with the latest technologies, hosts many events like conferences, congresses, fairs and exhibitions during the year.